Non ne so abbastanza: Extra! Extra! La notizia non è che la Regina d'Inghilterra abbia le scarpe bucate. 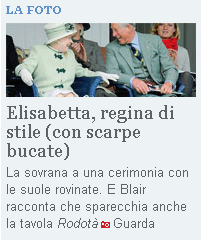 La notizia non è nemmeno che il Corriere della Sera e La Repubblica ritengano doveroso dare ai lettori una notizia che neppure la rubrica Royals di The Sun ha ritenuto di lanciare: e ce ne stupiamo un poco, dacché The Sun, seppur molto più serio e paludato dei due maggiori giornali di casa nostra, dovrebbe, non foss'altro per ragioni geografiche, essere più attento alle scarpe della Regina d'Inghilterra e di Scozia. 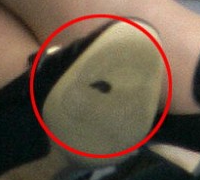 No: la notizia, quella vera, è che MLR non è in grado di distinguere un buco nella scarpa da una macchia, forse dovuta a un pezzo di cingomma attaccatasi alla Reale Suola. Io di buchi sotto i piedi sono abbastanza esperto: forse potrei propormi come consulente d'immagine per i due Grandi Quotidiani. Tutti siamo arrivati alla stessa conclusione, vedendo la foto. Repubblica invece insiste nel pubblicare foto e notizie che nemmeno il peggiore dei giornali scandalistici oserebbe prendere in considerazione. Io in qualche occasione ho protestato via mail, ma senza ottenere risposta. Che possiamo fare? Immagino che cacciare MLR non possa servire a granché (non foss'altro perché non solo il Corriere, ma anche Repubblica ha pensato bene di dare la ghiotta notizia). Direi che la cosa migliore da fare è di trattare queste cose come un servizio di prevenzione contro il Morbo di Alzheimer. Ogni giorno apri il sito, e se non riesci a trovare le "cinque piccole cazzate" vuol dire che il tuo cervello sta andando in pappa. A major part of boosting person's [b][url=http://www.edhardy.uk.com]ed hardy[/url][/b] self-esteem and total personality package is derived from his [b]ed hardy clothing[/b] choice up garbing up in style or in ways he feels comfortable. It is a given fact that a person's way of styling himself up in everyday basis speaks a lot about his own personality. Bubbly and outgoing type of people more often than not choose light and pastel [u]ed hardy clothes[/u] shades while the more refined and reserved type of people settles for the safe shades of the [u][b]cheap ed hardy[/u][/b] spectrum. But still there are those whose loud and expressive personalities are evident on the unique prints and cuts and styles that they make and match. Talk about the fashion sense that goes beyond the mold of monotony. Ed Hardy Clothing is the name of the apparel line. These are fresh, unique, vibrant and [b]ed hardy UK[/b] stylish apparel choices like hoodies, jeans and shirts, caps and long sleeved shirts. Having the chance to purchase and literally wear the [b]ed hardy[/b] clothes that are dictated by the latest fashion craze brings natural high to the person. However, the ability to wear the latest fad with ease and comfort remains to be the challenging part. This is mainly affirmed by the idea that one fashion forecast may [b]ed hardy UK[/b] not always fit every single person. But Ed Hardy jeans and shirts are so stylish and flexible that it can be literally worn by almost [u][b]ed hardy t shirts[/u][/b] everyone. The shirts and jeans are made of lightweight materials and every shirt has that unique and expressive print that captures the vintage look. These are [b][url=http://www.edhardy.uk.com]ed hardy UK[/url][/b] so carefully conceptualized by the greatest tattoo artist of [u]ed hardy clothes[/u] his time, Ed Hardy. That simply confirms that the ideas and concepts embedded on the Ed Hardy Clothing are rooted to the natural flair of its maker and founder for unique and meticulous designs. The street wear for the street smart speaks [b]cheap ed hardy[/b] a lot about the fashion concepts of Ed Hardy Clothing Line. The suave cuts and colors in the Ed Hardy Hoodies has become a popular flair among those who choose to mellow on their daily garb. The sneakers and Ed Hardy Jeans are [u][b]cheap ed hardy[/u][/b] complemented by the Ed Hardy Hoodies with its intricate vintage prints. The young professionals who choose not be held captives of the preppy and casual look of collars and slacks opt for the lazy jeans, shirts and hoodies for that relaxed and casual feel. This is the [u]ed hardy t shirts[/u] normal look preferred by the hippies, artists and yuppies alike.